Arthrozene is a 3-step solution that contains three active ingredients which may help with joint pain, stiffness, and inflammation while improving mobility and flexibility. This next generation formula also promises to slow down cartilage degradation and increase lubrication and it has been clinically tested to assure users that it is safe and efficient. Who is the Manufacturer of Arthrozene? The company behind the product is Fisico Inc. They appear to be an established company with a good reputation in the industry. The company has an official website which includes product information and all contact details. Arthrozene is a three-step solution with key ingredients that are purported to reduce inflammation, pain, and stiffness. Containing Boswellia Serrata, Hyaluronic acid (or HA) and B-2Cool, the proprietary formulation also claims to prevent cartilage breakdown and increase lubrication for better flexibility and range of motion. With these powerful joint health ingredients, Arthrozene is a formula that may offer pain relief, comfort, and mobility. Arthrozene Ingredients – Are they Safe & Effective? This potent formulation contains three active ingredients that are responsible for proper joint health. Type II collagen – Present in B-2Cool®, is the main protein found in cartilage and acts a shock absorber. The daily dosage of the patented B-2Cool® is 40 mg per day and it has been proven to stop the breakdown of cartilage. Hyaluronic acid (or HA) – Is another protein of synovial fluid. Injecting this protein into a joint has been proven helpful in treating pain. However, this injection is reserved for severe pain and may only be administered by a doctor. Thanks to recent discoveries, it has been established that you can take another compound known as Mobilee® for a similar effect. Boswellia Serrata – Is a herb that can be found in native parts of Africa and the Middle East and has been used for many years as an anti-inflammatory. This joint pain supplement contains an optimum amount of the extract in AprèsFlex® which is ten times more powerful than other Boswellia extracts. It is better absorbed by the body to prevent joint pain and stiffness. What are the Advantages of Arthrozene? This pain relief product might be able to provide a range of different benefits for any user who is struggling with poor joint health. This includes relief from pain, soreness, inflammation and stiffness. The product includes prominent ingredients which should increase synovial fluid for better mobility. The product also contains key ingredients that should stop the breakdown of cartilage and help with increased mobility and flexibility. What are the Disadvantages of Arthrozene? While the dietary supplement claims to attack joint pain and stiffness at their root, it may take a long time to produce results. The product is all-natural and said to be side effect free, but some people may experience issues such as nausea and stomach upset. When compared to similar formulations, this is one of the higher priced products and there is no evidence that it can work well for severe conditions of joint pain. How Should You take Arthrozene? The company recommends taking one pill per day with a glass of water. The pill should be taken on an empty stomach. One bottle costs $49.95 while three bottles are $44.95 each. Six bottles are $39.95 each and the three and six-bottle packages come with free shipping. What is Arthrozene Return Policy? The company offers a 90-day, full money back guarantee which is not inclusive of shipping and handling. If you feel unsatisfied with the product, simply contact the support team to request your refund. Does Arthrozene Offer a Free Trial? 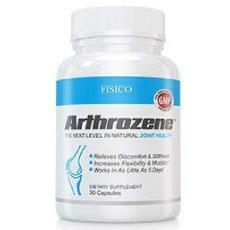 Arthrozene is a formulation that makes several claims regarding its effectiveness in combating joint pain and stiffness. The product claims to eliminate inflammation and increase synovial fluid for better mobility. Further, this supplement purports to stop the breakdown of cartilage which may cause joint problems. While this formulation may help with joint pain, it may also cause some side effects despite being an all-natural product. The company claims to have used potent ingredients to alleviate pain, inflammation and soreness and states that the product is very fast-acting. However, it is more expensive than comparable joint pain products so it is worth considering all the options available before choosing to buy this brand. Taking care of the joints is vital to well-being particular as we age. Using a product that ensures the joints are kept healthy means that we can enjoy pain-free movement and full mobility over the long term and prevent the onset of more serious joint health conditions. It is about time these companies started selling genuine products. I have been in a lot of joint pain lately due to a condition that keeps recurring. Recently, my doctor advised me to try out supplements instead of the conventional medication. He gave me a list of them. I don’t know how I even landed on Arthrozene, which is a complete waste of money. I have not noted any changes so far. I had to call him and confirm whether I bought the right product or not. He said it was and told me it worked for his patient a year ago. Well, it may have worked for them, but it sure hasn’t worked for me. I have been using Arthrozene for about a month now. Although it has relieved some of my pain and swelling, I have not noticed any improvement in flexibility, which is what I was really looking for. I think if I could achieve this, my quality of life would be so much better. Because of that, I can’t give it a full 5 stars. Effective and convenient to use. Being a receptionist in a hotel means sitting in a chair and writing for long hours. This eventually took a toll on my body, especially my hands, knees and waist. I would often not be able to walk conveniently after sitting for a period. It got so bad that I could hardly sleep at night, I would have to lie on my side before I can get decent sleep. I could not give up on my job, at the same time, my body was deteriorating. That was when I began to seek medical options, and I came across Arthrozene, which was recommended in a local hospital close to my office. Arthrozene has really been helpful since I started using it. I no longer feel stiffness in my waist, and my joints feel more relaxed. Now I feel like I own my body and its all thanks to Arthrozene. I’m just not sure about Arthrozene. I know that some of the ingredients have been proven to be beneficial for osteoarthritis. I was hoping to repair some of my joint damage. A friend told me that Arthrozene helped her avoid knee surgery, so I was pretty excited to try it. Unfortunately, it just has not really worked for me. So, I don’t know if it just doesn’t work for me or if it was unusual that it worked for my friend. I’ve been suffering from joint pain for the past five years. I’ve tried many different supplements and medications to try to ease my discomfort and pain. Nothing has really worked. This includes Arthrozene. I was pretty skeptical before I used it, because I’ve tried so many things. I’ve been using it for several weeks now and I’m not noticing a difference at all. I am still extremely stiff in the morning when I first wake up. I will continue to look for a product that may actually help me.